On May 1st, Earth’s Mightiest Heroes will once again assemble to save the world in Avengers: Age of Ultron. This time around, your favorite superheroes will be working together to defeat Ultron, a robot with a major attitude and an army of ’bots at his command. 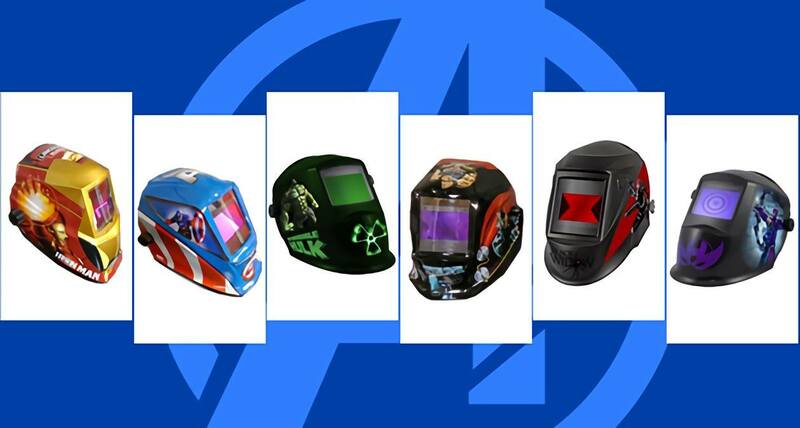 In honor of this highly anticipated Marvel movie, check out the following Avengers-themed welding hoods. Which character would you choose? The God of Thunder hangs around helping his fellow Avengers conquer any threats that come along. When he’s not walloping enemies with his magical hammer, Mjolnir, Thor spends his time learning more about humans and our quirky ways. 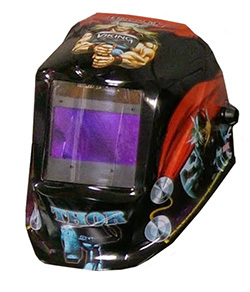 The Thor welding hood includes the image of this famous Asgardian on it, but don’t expect it to give you the power to call down lightning. You’ll still have to use plain old cords and sockets to power up your tools. Tony Stark, better known as Iron Man, is a genius at coming up with inventions, including his high-powered suit that lets him fly around and take out enemies with lasers and other cool gadgets. 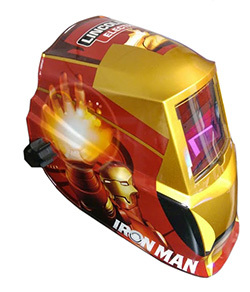 The Iron Man welding hood features the character’s signature red and gold design to inspire you to do some creating and inventing of your own. Lasers not included! Super scrawny Brooklynite Steve Rogers transforms into super soldier Captain America thanks to a special serum. After being encased in ice for decades, Cap thawed out and took on the leadership role on the Avengers team. 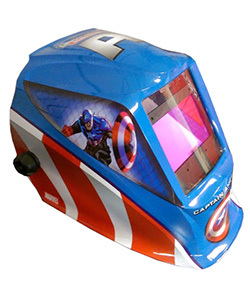 The Captain America welding hood has this superhero’s vibranium shield on it, although it doesn’t have its indestructible powers. Scientist Bruce Banner tries to keep his alter ego, the Hulk, in check, but the giant green smashing machine tends to come out when he gets angry. The Hulk does have some control over who and what he smashes, making him a valuable member of the Avengers team when they’re up against dangerous foes. 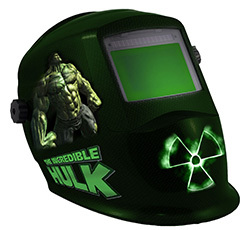 Power up with the Hulk welding hood, which features the big guy’s colors and likeness. Natasha Romanoff, aka Black Widow, is a former Soviet spy who’s trying to make amends for her past by erasing all the red in her ledger. With her trademark wrist stingers, hand-to-hand combat expertise and ability to trick people into revealing important info, Black Widow excels at taking out enemies left and right. 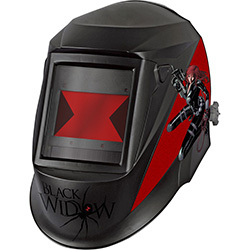 The Black Widow welding hood won’t make you as stealthy as this super spy, but it will let you weld in style. Clint Barton’s superhero name, Hawkeye, comes from his uncanny ability to hit targets 100 percent of the time, even without looking directly at them. Hawkeye’s weapons of choice aren’t your everyday bow and arrow. He’s got arrows with explosive tips and other enhancements to help him demolish enemies from a distance. 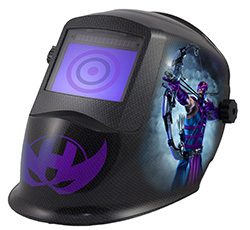 The Hawkeye welding hood features this superhero’s colors and symbols, although it won’t give you his eagle-eye vision. Do you have custom welding hoods you’d like to show off? Share your welding hood with us and we’ll share your photo with the Tulsa Welding School social community.